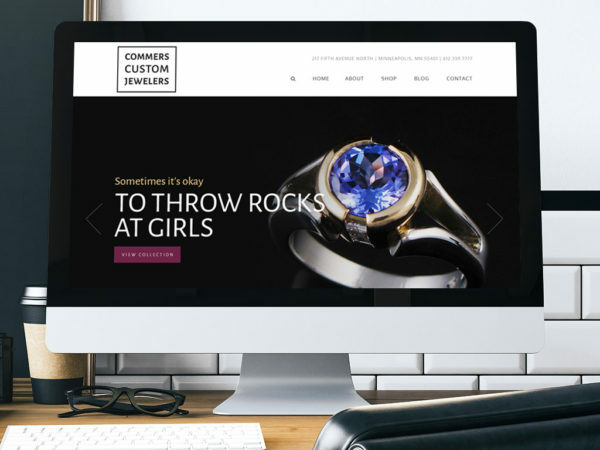 In an industry with a wide range of quality and price point, it was critical that Commers Custom Jewelers have a website that accurately portrayed their elegant and high-end custom work. And their old site wasn’t doing the job. Website. After visiting Commers’ store and workshop in the North Loop of Minneapolis, we saw the highly visual possibilities for a website that relied less on text-based content and more on photography of Commers’ stunning work. Video. As part of our content package, we created a video that walks the audience through Commers’ process for creating custom jewelry. It showcased footage of owner Sara Commers working in her shop along with photos of her custom pieces and shots of her discussing her process. Content. For some organizations’ websites, videos and photos are the content. This was the case with Commers Custom Jewelers. We wrote minimal text for the site, allowing the photos of the pieces to speak for themselves. The search engine optimized content we did write was spunky and flirtatious, in keeping with the personality of the brand. Call us today to learn how we can use video and a new website to tell the story of your business. 651.357.4174.